Update: Note that we also now have our own comprehensive review available here which compares the Airspy, SDRplay RSP and HackRF. 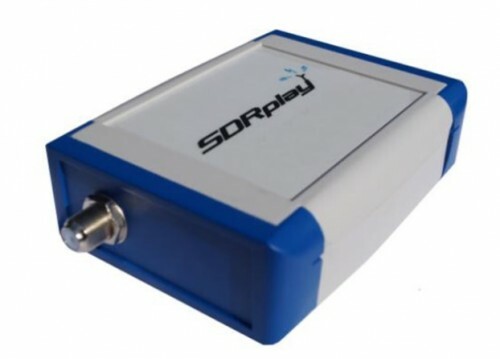 The Radio Spectrum Processor (RSP) by SDRplay is a receive only software defined radio with a 100 kHz to 2 GHz range (with a small gap at 380 MHz to 430 MHz), a 12-bit analogue to digital converter (ADC) (~10.4 ENOB), 8 MHz bandwidth and a bank of several switched front end filters. It currently costs $299 USD and with these specs and price range we consider the RSP to be a competitor to the Airpsy and Funcube Dongle software defined radio offerings. Recently several reviews of the SDRplay RSP have been written online and in magazines. The first review comes from the pages of the UK based Radio User magazine (pdf warning) which goes through the specs, design, install and operation of the device. A more recent review shows an unboxing and there’s also this review submitted to the SDRplay team which demonstrates some FM dxing results. There are also several more reviews collected by the SDRplay team linked on the SDRplay website at http://www.sdrplay.com/reviews.htm. We also note that we recently posted about some in depth measurements that Leif (programmer of Linrad) recently made to multiple SDR’s, including the SDRplay. We have now released our updated API – the new API fixes the frequency gap we have had up until now (previous gap was 380MHz to 420MHz worst case) -. It has been completely removed. .
SDR# and HDSDR users can benefit immediately from these features. It will take a while to get SDR-Console modified to remove the gap – we will let you know as soon as that happens. I recently bought the SDRplay when the price dropped. I also have an Airspy, but I refused to buy one new, as the developer is a remarkably quinine individual, so I borrowed one from a local ham (though recently was offered to buy it, as the owner preferred the SDRplay anyway). Well, it seems that the gap on my SDRplay is only 390-405. The built in filters are very effective, but what I was amazed at was the sensitivity, which was 2-3 dB better than the Airspy. Even with Airspy decimation ans endless tweaking, the SDRplay was still able to make readable signals that were barely present on the Airspy. On top, having really decent HF reception built in to the SDRplay, makes this unit a keeper. The AIrspy will now be sold off before the price drops, which really has to be soon. The latest edition of Spectrum Monitor has a great review of the RSP by Thomas Witherspoon K4SWL where he writes ‘I can confidently recommend the SDRplay RSP to those who want to start out with a good-quality rig. Indeed, for many, it might out-perform other receivers in their shack’ – the article can be obtained by going to http://www.thespectrummonitor.com/ and selecting the June 2015 issue. Our additions to the library have been submitted to the library owner and we’re just waiting for confirmation of when the master repository will be updated to include them. The SDR Play Website (http://www.sdrplay.com) states that it is a “…general coverage receiver spanning Medium Wave (100KHz) through to Microwaves (2GHz) with just a tiny gap between 380MHz and 430Mhz…”. I’m not sure if that original gap spec changed or it is just a typo on the above article. That obviously makes a huge difference to many radio monitors – at least in the US. Yes sorry we had made a typo there, fixed now thank you! The missing slab of 400Mhz is a deal breaker for me too. In Australia, the 400-430Mhz band is the designated State and Federal public safety/Government Radio band. In addition, it appears that the SDRPlay may actually miss out on part, or all of the 70Cm amateur band. I feel for the backers of the SDRPlay, they have obviously invested a considerable amount of time and money into this device, but prior to developing something like this, you really have to make sure you will have some kind of performance or price advantage over your competitors. I’m seeing neither in this product. Oh well, back to playing with my FCDP+ and Airspy. 380>480MHz is TOO important for me to ignore. (In Europe) the most intesting Frequency are in this Area. I don’t see it as competitive. It’s 3x the price that it should be. Compared to the AirSpy it’s inferior in nearly every major specification, other than it’s HF coverage. You could easily solve that with an AirSpy + a very good upconverter and still save around $100. I don’t disagree with you on it being inferior, I don’t have one so I can’t disprove or prove what you say. As much as I love my Airspy, it costs $199 excluding import duty and shipping. And this product costs $299 including UK(EU) VAT and shipping. I’m trying to workout where the $100 saving is, especially when you add in the cost of a good quality upconverter ? I have both an Airspy and an SDRplay RSP and I can categorically say that based upon my experiences with the two devices AgentJim is talking rubbish. I bought the SDRplay when it first became available last summer and the Aisrpy early this year. I purchased the Airspy because I was under the impression that the SDRplay device only had 10 bit converter and the Airspy had 12 bit converters and I thought I would get an additional 12 dB of dynamic range. In practice I found that the dynamic range of the two devices to be pretty nigh identical using SDR# as a common platform for reception. Upon more detailed investigation, it turns out that the SDRplay team had (perhaps a bit naively) been quoting ENOB whereas Airspy had been quoting raw resolution. Not an apples to apples comparison. What I like about the Airspy is its size (it is a very neat little box) and it gives contiguous coverage from VHF through to nearly 2 GHz. What I don’t like is the nasty little micro USB socket that feels flimsy and gives unreliable connectivity with some cables that I have. Where the SDRplay was really weak when it was launched was in the support for SDR apps. All it has was a very basic plugin for SDR#. However, since then things have improved MASSIVELY with support for SDR Console and HDSDR (my personal favourite). They are also promising a proper Linux driver for GNU Radio ‘coming soon’, which would be fantastic, because the existing Linux osmosdr driver doesn’t seem to work properly from what I have heard. Overall, I feel there are pluses and minuses to both products with for the most part, little performance difference between the two. Where the SDRplay really wins hands-down is when it comes to sensitivity. When I first started using the Airspy in the 2m band and also with DAB in Band III (using SDR-J), for some reason, it just seemed a bit ‘deaf’ compared to what I had become used to with the SDRplay. I live in an area with very strong FM signals, but very poor DAB reception. I initially put it down to variations in at atmospheric conditions, but after a while, I decided to do an objective comparison using a RF signal generator and an software SINAD application with SDR#. I found that the Airspy was between 2.5 and 3dB worse in terms of its conducted sensitivity. I estimate that the NF of my Airspy is about 6 dB, which was really disappointing as they claim 3.5 dB on their website. The SDRplay seems to be around 3 dB or better. At some point, when I can find the time, I will put the data for the side by side comparison together and post it for anyone who is interested. Finally, the Airspy seems to be a bit more susceptible to USB noise and I don’t really understand why. I had to use ferrites with my USB cable an use a long cable to keep the little chap well away from the PC or I found spurs all over the place. For some reason, the SDRplay doesn’t seem so vulnerable, but it is hard to to make an objective comparison because I can’t use the same cable. If I had my time again, I would probably still buy both. In an ideal world, the SDRplay wouldn’t have a gap above 380 MHz, but it does and for some people that will be a deal breaker. For me, it wasn’t. On balance, I find myself using the SDRplay most of the time, so I guess that tells me where my instinctive preference lies! To Yagi23 – thanks for an objective comparison with the AirSpy as I only own the SDRPlay (my comments quoted in a link above). A couple of observations – lots of ‘jumping up and down’ because there is a frequency gap in the SDRPlay unit. Well the same (or larger gap) holds true for the FCDPro+ as they use the same tuner chip. As for price comparison – SDRPlay has just dropped the price to $149/£99 as the volume of production has increased- but that is excluding VAT and shipping. So it’s now $50 under the AirSpy on a like for like basis. I worked out that the $199 + VAT + shipping + import tax lifted the cost of the AirSpy to around £165-170. I can offer one good reason to buy an Airspy rather than an SDRPlay – you don’t have to worry about the IF image with Airspy as it doesn’t use zero IF but is more like a DDC type SDR (so I’m told). At the moment the auto imbalance correction of SDR Sharp doesn’t work with the SDRPlay – so you need to use HDSDR for best performance. (Not necesarrily an issue with SDR#- as it works on my RTL dongle). I can offer one good reason to buy an SDRPlay rather than an AirSpy – issues around USB 2.0 port performance with 10Mb sampling rate (see various posts). SDR Play is only 8MHz so won’t push it so far. But that is dependent on your computer. What tipped my decision toward the AirSpy was it came with a 14 day money back guarantee and it was available for immediate shipping. That meant I could check whether the 10-bit ADC would overload or not. It didn’t – because it turns out it was 12 bits.